The paintings, photos, thoughts and travels of a freelance artist. Bless my Mom for saving our childhood artwork. It has been in her closet all these years, carefully saved with the dates written on the back. I was surprised to find that my choice of subjects and their composition had often repeated themselves. 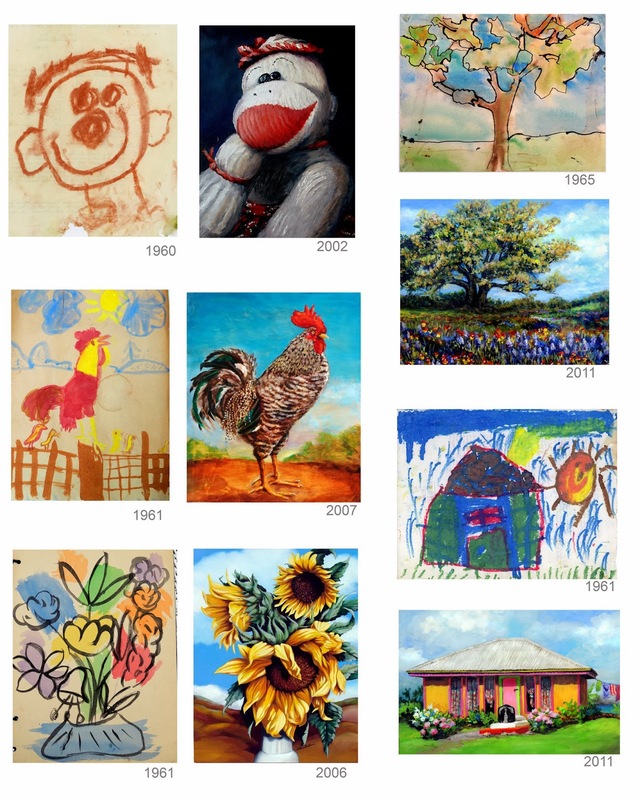 Through all the tumult and struggles of an adventurous life, painting has clearly been an avenue for reconnecting with the care free joy of childhood. Risking the security of a real job, throwing caution to the wind and often taking the path of most resistance are not things I can honestly recommend, but I have no regrets. Choosing uncertainty and risk guarantees you will feel fully present when you think the ship under you might be sinking a thousand miles from land, when gallery owners hand your work back as if it belongs in kitty litter or when you nearly miss a flight in a foreign country during a coup with ten dollars left to your name. Life is grand. I sincerely hope all your goals will be realized and dreams come true. Happy New Year! The night before Thanksgiving I didn’t know Mom was having a heart attack. She could not tell me where she was hurting. I thought she was coming down with the flu. Dementia is unkind in so many ways. Even in the ER they did not know right away since nothing indicated massive trauma. What an incredibly strong woman to endure so much pain while making silly faces to amuse the nurses. The doctors could not explain how her heart could still be beating, but I knew. Even without memories or a conscious connection to place and time Mom wanted to live. She loved life. And she was so strong that it took six days before the other half of her heart finally gave up. She was at home as the hospital had released her into our care through Hospice. I won’t describe her time in the hospital or her end. Over time hopefully those images will blur and become less disturbing. My Mom was a funny woman with a quick wit, which is how I will remember her. The violent and crude behavior as a result of advanced dementia I will forget in time. I practice fast forwarding through the difficult memories until I land on a good one, then I savor it and push the others aside. Overall I wish there had been less anger in our lives. None of us ever quite fulfilled each others expectations. Mom would call me a pill and advised me to quit taking myself so seriously. I suggested she attend AA meetings. I’m not resentful about the time I spent caring for my parents. In a perfect world we would have been happier and less irritated with each other before disease ruled our interactions. Negative emotions certainly get in the way of having fun. I stayed present through the last ten years choosing time in the gym and hiking for solace over liquor and denial, but no judgement. They served a purpose for awhile in my life also. I held Mom’s hand as she departed. She said “I love you” often, before her heart failed rendering her silent. She could not remember my name, but I chose to believe she loved me because it felt better that way. I miss the goofy fun moments. I wish I had a photo of her buying a chocolate taco in her Tigger slippers at the colorful ice cream truck in front of the house from the wizened old guy with long white whiskers wearing a blue turban. She was never too proud to laugh at herself. She shuffled around in those silly slippers, which were advantageous as it hurt less when she kicked me. I hope she found Dad in heaven because the last year that she spent looking for him in closets was as heartbreaking as it was annoying. I love you Mom and hope you are at peace. I did my best. Feel free to haunt me now and then, I know you’d laugh about scaring me. Damn, this is one big empty house without you.